I've had a keen interest in skincare since a young age, partly due to my mum who instilled in me the importance of looking after my skin as a teenager. This means I'm very fussy when it comes to the brands I use, but I love (arguably more than most) trying new beauty products, especially ones that I know will be good for my skin! 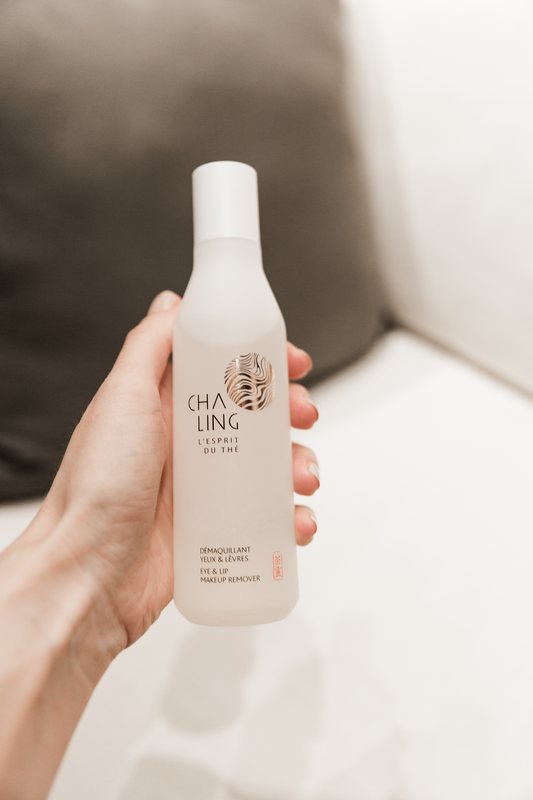 So I'm introducing you the new Parisian skincare brand, Cha Ling, from LVMH. Inspired by the wisdom of Chinese culture, the range harnesses the powerful anti-oxident and anti-aging ingredients that are evident in the Pu’er tea - an ingredient that has been used in Chinese medicine for over 5000 years. Cha Ling products have also been created using almost 95% natural ingredients and the brand does its best to minimise its ecological footprint by creating re-chargable porcelain cases crafted from natural, non-polluting materials, using eco-designed packaging and contributing to reforestation by planting 20 hectares of tea trees with a social and ecological approach. Which all speaks to my own personal ethos of better living. Products that are good for me and the environment! I had the pleasure to experience Cha Ling at the Peninsula, Paris a few weeks ago by way of a facial in the hotel's spa. The largest in Paris, the Peninsula Spa's interior is a mix of Eastern and Western elements, with an Asian tea lounge serving a range of speciality teas, making it the perfect environment to experience the Cha-Ling world. One of the hotel's six restaurants, Lili even serves Cantonese cuisine and specialises in Chinese tea! Arriving at the Peninsula’s Spa is immediately soothing (not to mention the grandeur as you walk through the hotel’s lobby) - the space is bathed in low golden lighting, exotic scents waft through the corridor and soothing music plays melodically in the background. A Cha Ling therapist welcomed me and showed me into one of the therapy rooms. After she asked me a few questions about my skin – it’s sensitive and often dry (I have a hard time remembering to drink water) and she explained the different types of facials she could give me – I opted for one that was re-hydrating. While she prepared the products, I changed and was asked to lay face down on the therapy bed. My 60minute facial began with a steam from water infused with tea to purify my pours. The scent alone was enough to relax me. She then removed any excess make-up with the Eye and Lip Makeup Remover, also beautifully scented. The same scent runs through the entire line of products that also includes an Eau de Toilette – it’s a delicate fragrance crafted from a tea flower blended with woody notes of the Pu’er tea café. Unsurprisingly it’s become one of their best-selling products. It’s fresh, invigorating and reminiscent of cut grass or morning dew - not at all like a lot of traditional perfumes, which I often find too sweet or over-powering. It’s the kind you could and would wear on a daily basis. The deep tissue massage that came next focused on acupressure points on my body – (developed from Chinese medicine), and was finally reinforced by the Gua Sha, a porcelain massage tool from Asia that I do advise you to try at home. The shape has been created to effectively massage the contours of your face. (The more I read about anti-aging - massage, alongside great products and minimal sun exposure is the key to maintaining youthful skin!). I could already feel it working its magic on the muscles of my face. She then sprayed the Preparing Mist Lotion, which not only tones and moisterises, but also preps your skin for following skincare steps. She applied the Mask using a brush, which she left on my skin for 10mins. It was particularly good as it didn’t leave my skin feeling tight, as so many masks do. And finally the Plumping Essence, which is great for day or night and plumps the skin. She topped this off with the Rich Cream. I finally emerged (almost like a phoenix) from the spa, feeling fresh and renewed, with hydrated, highly moisterised and supple skin, in time for a healthy lunch in the hotel's Terrasse Kléber restaurant. Although I was so relaxed, I would have happily napped for an hour instead! You can find Cha Ling products here. The view of the Eiffel Tower from the Peninsula's L'Oiseau Blanc restaurant. This post was created in collaboration with Cha Ling.